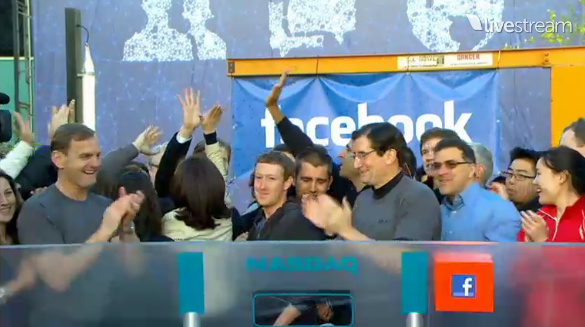 Facebook chief executive Mark Zuckerberg didn’t travel to New York’s Times Square for the company’s big day. He did it unconventionally like you’d expect a hacker would. He opened the bell remotely from the company’s Menlo Park Headquarters after Facebook employees had just finished a long, all-night Hackathon — their 31st. They played midnight hockey and worked on extra projects, as you can see from photos we re-posted here. 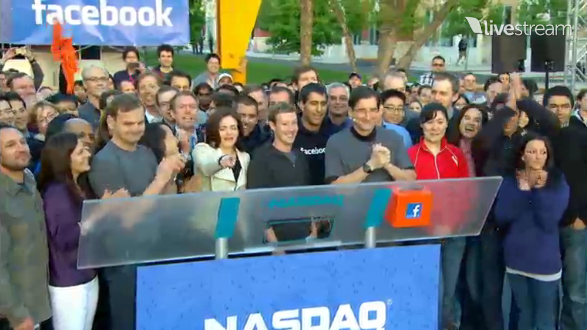 Just ahead of the 6:30 PST open, the company’s employees got together again in the main headquarters “Hacker Square” in front of a big stage where he rang the bell. A Nasdaq representative gave him an honorary hoodie and trophy. 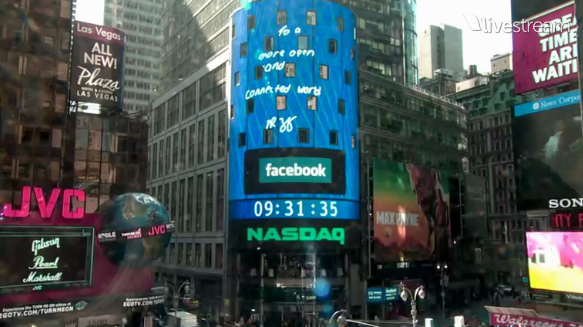 Facebook is the second company ever to ring in NASDAQ’s bell remotely on its IPO day. Zynga was the first back in December. He was flanked by chief operating officer Sheryl Sandberg, vice president of product Chris Cox and Elliot Schrage, who is Facebook’s vice president of public policy and communications. 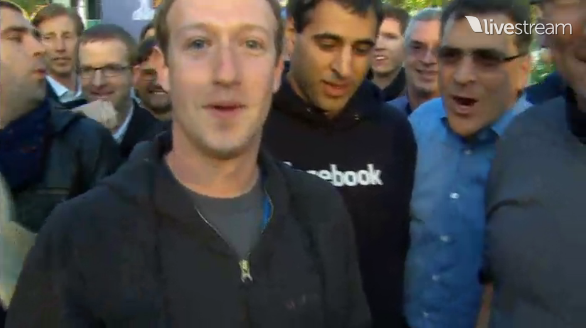 It was the culmination of an eight-year journey that began in Zuckerberg’s Harvard dorm room. But it’s the company first step in what may be a very long life. 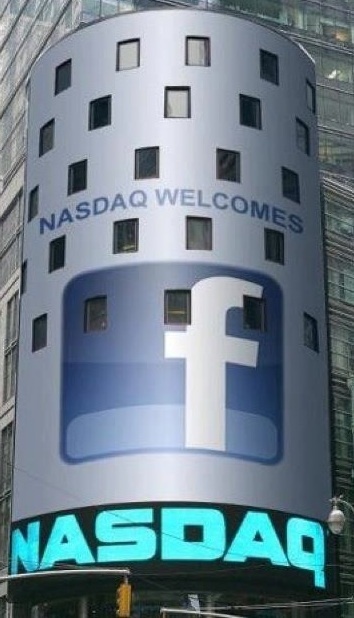 Facebook is the most anticipated IPO of the last eight years after Google. 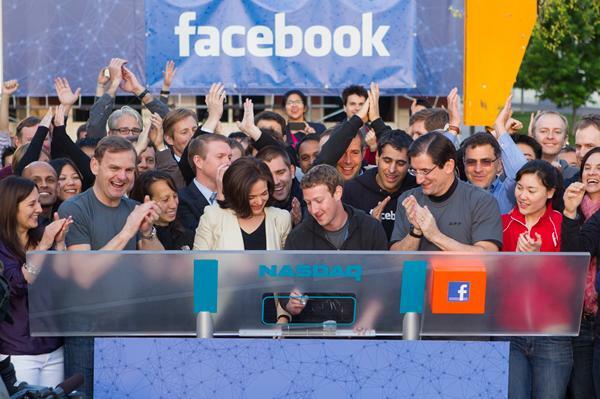 It’s the largest tech IPO in history because the company stubbornly waited so long to go public. 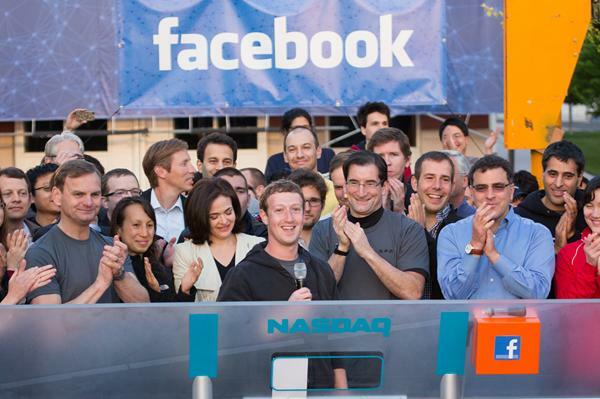 Facebook and its early shareholders are raising $16 billion today, or nearly 10 times what Google raised in its highly-hyped and very unorthodox Dutch Auction-style IPO in 2004.